I am re-posting this from last year. I think this is always handy to have around. My sister had to use the last of our batch from last year just last weekend. Make a batch today so you have it on hand. Please remember the best form of sun protection is to prepare in advance and wear sunscreen. I suggest a mineral based sunscreen and we like to use this version from Babyganics (though it can be a bit smeary if applied to heavily). Every now and then it seems that I get to busy with my children to take care of myself. This last weekend was a prime example of this. I sprayed the boys down well with sunscreen first thing as they left the house, but an hour later when I went to work in the garden I forgot to protect my own skin. I spent a few hours working in the garden while the clouds lazily drifted over the sun from time to time so the thought of sunburn did not really enter my mind. I accomplished a lot in those hours so I was feeling pretty pleased, until I went inside to fix dinner and then I felt pretty warm. Did you know it is easiest to get burned while it is cloudy out? Well, I am living proof of that. Thankfully I was not to exposed so my only body parts that got to much sun were my shoulders and a small part of my upper back. Knowing that it would come to be painful I decided to do some research on what would help relieve the skin the most and the fastest. I learned that lavender essential oil is amazing on all skin burns of any kind. The healing properties are wonderful and soothing for the skin. Colgate toothpaste really does pull out a burn. I don’t know if this one works on sunburn yet as I have not tried it but it really does wonders on a burn from a stove or other hot item. I once used Colgate and lavender essential oil on Tag Along after he grabbed a hot item. As soon as it happened I raced into the bathroom for our special tube, we keep it just for burns, and put a big glob in his hand. You can watch the toothpaste turn to a soup consistency as it pulls out the burn. I repeated this twice and then gently rinsed his hand. I followed it up with lavender essential oil. Being the frazzled mama I dropped three drops of it right onto his burn and he never even blistered! Since then I have told everyone I know who has had a burn. You should never exfoliate the skin! If you aren’t the type to peel a scab, another thing I would not advise doing, then do not try to exfoliate your sunburned skin. Treat it gently and let the skin shed itself. Apple Cider Vinegar can pull the painfulness of the sting out of your burn for a time. I was surprised to learn this and to be honest I do not understand the science of it but for some reason it helps to rehydrate the skin. Since most everyone has apple cider vinegar in their homes this is definitely worth trying if you have it on hand. There are even recipes online for misting your skin with a blend of water and apple cider vinegar. Vitamin E oil (organic or non is fine)helps to control the burn as well. However, this is a very sticky substance. I just happened to have some on hand after needing it with our last baby but I would not say it is a must have. Coconut oil helps the skin to heal remarkably well. Being anti-microbial and packed with hydration it really aides in the healing of your skin. I did read that some say not to put it on for 48 hours after a sunburn but I did mine the same day and noticed my skin felt much better on day two. This would be your call. After reading all of this information I wanted to create a burn cream recipe that can be used for any type of burn. Here is what I came up with and I hope you enjoy it too. 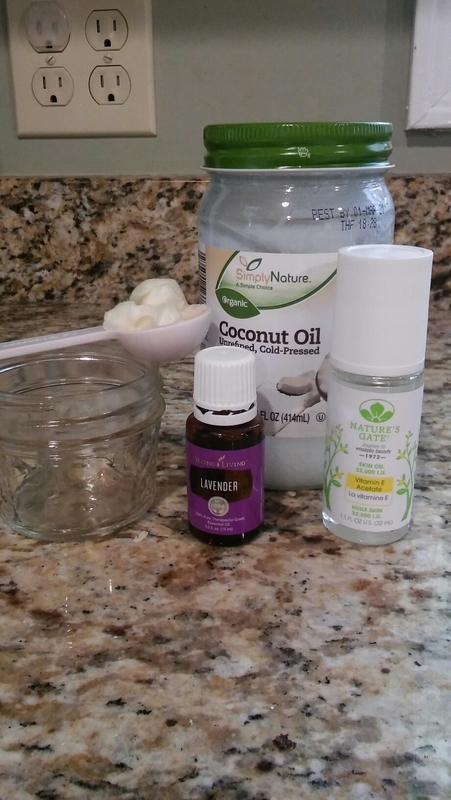 Directions: Mix Vitamin E oil, Coconut Oil and Lavender Essential Oil together. Be sure to mix well. Use cream liberally several times a day on affected area. *If you are using the Shea butter simply add to the mixture of the other three ingredients. Again mix well. Using the Shea butter will provide you will with a thicker cream and lock in more hydration. The melting point for Shea butter is higher than coconut oil so it will be creamier and less liquid the more you add. Store cream at room temperature in a sealable container. Note as well that the consistency of your cream will depend on the temperature of your house. 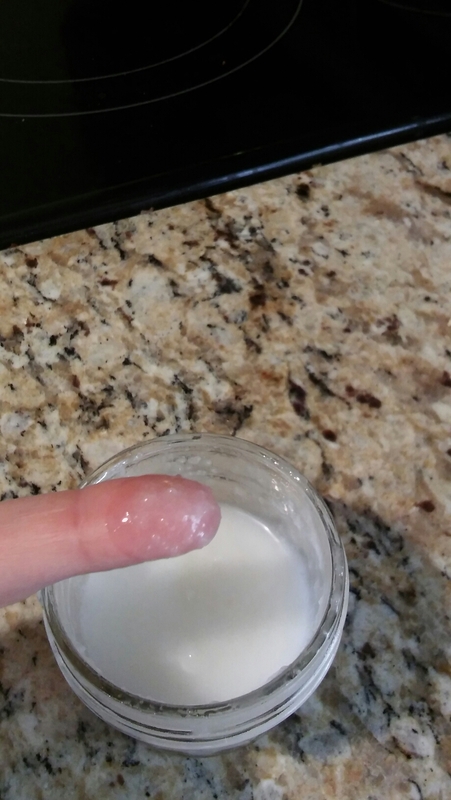 You will also find that the cream turns to liquid once it sits on the skin. As always remember that the best way to stay of a sunburn is never to get one. So please, don’t be like me, remember your sunscreen.